Student engagement is a key concern for educators. Does effective learning take place if students are not able to make meaningful connections with course material? Blended learning has been shown to increase both student engagement and achievement more effectively than both in-person and online instruction alone. High school ELA teacher Caitlin Tucker has stated that the blended learning model has created “more meaningful” learning experiences for students in her classroom. (2) She feels this is because of students’ familiarity with technology, as well as the student-based goals and activities that are more relevant to the course and curriculum. The overhaul of an entire course can be very time-consuming. The educator must be willing to make this initial shift in order to promote student enthusiasm and achievement. Shifts in pedagogy and delivery take time to develop and deliver with efficiency. Blended learning is both time-consuming and requires a shift in student outcome goals. However, if the end objective is increased student engagement and achievement, the end product is worth the effort. “Evaluation of Evidence-Based Practices in Online Learning .” September 2010. Accessed September 27, 2017. https://www2.ed.gov/rschstat/eval/tech/evidence-based-practices/finalreport.pdf. Tucker, Caitlin R. “The Basics of Blended Instruction.” Educational Leadership70, no. 6 (March 2013): 57-60. Accessed September 27, 2017. Kaleta, R., K. Skibba, and T. Joosten. “Discovering, Delivering, and Designing Hybrid Courses.” In Blended Learning: Research Perspectives, 111-43. Needham, MA: Sloan Center for Online Education, 2007. Mcgee, Patricia, and Abby Reis. 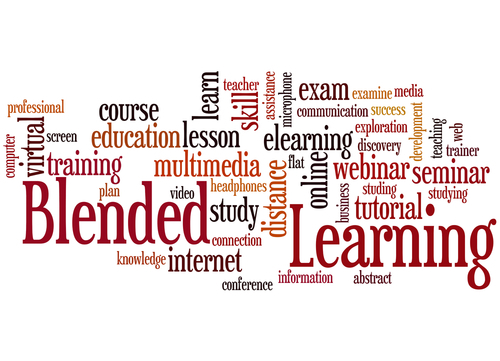 “Blended Course Design: A Synthesis of Best Practices.” Online Learning16, no. 4 (2012). doi:10.24059/olj.v16i4.239. Kenney, Jane, and Ellen Newcombe. “Adopting a Blended Learning Approach: Challenges Encountered and Lessons Learned in an Action Research Study.” The Journal of Asynchronous Learning Networks15, no. 1, 45-57. Accessed September 27, 2017. Vaughn, Norman. “Perspectives on Blended Learning in Higher Education.” International Journal of E-Learning, January 1, 2007. Accessed September 27, 2017. https://www.thefreelibrary.com/_/print/PrintArticle.aspx?id=159594390. Butler, D. L., and M. Sellbom. “Barriers to Adopting Technology for Teaching and Learning.” EDUCAUSE Quarterly2 (2002): 22-28. Accessed September 27, 2017.